Don’t Waste Gas on Trips to the Dump! The price of gas is becoming astronomical. Why continue wasting gas on trips to the dumpsite? 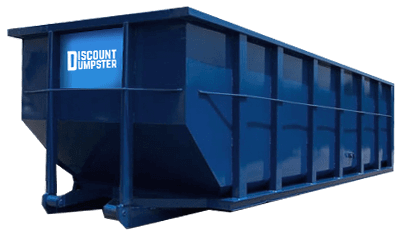 Discount Dumpster is here to save you time and money when it comes to waste disposal. Our walk-in dumpster rentals have set the business model since 2005. Our expertise has been gained through years of waste management. We want to be the first to call to haul your junk in Aurora. Call us today to experience our first-rate service and have questions answered. It is now time to get rid of that garbage. Your in-laws have left, and now you have to clear out the trash from the party. Don’t Panic. Our walk-in dumpsters are a perfect alternative. You can rent a 10 yard to easily remove that food and packaging from the presents. You might even have enough space left over to clean the attic. The possibilities are nearly limitless! The 10 yard bin is for customers with light fix and flips. Its compact size allows you to deliver the container on most residential streets. The 10 yard allows you to remove household construction rubble responsibly. Slightly longer than the 10 yard container, the 15 yard is the customer’s choice for DIY spring-cleaning projects. 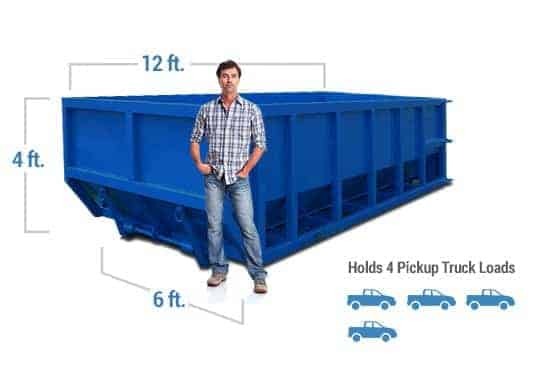 The 15 yard’s size allows you get rid of accumulated waste. Its low height allows for simple walk-in of material by way of the loading doors. The 20 yard roll off ideal for multiple bin rentals. You can transfer several tons of heavy items with this method. The 20 yard is typical for discarding bulky garbage. Smaller than the 40 yard bin, the 30 yard is for municipal demolitions. Its relatively large size allows the container to hold large rocks and wood pillars. With 30 cubic yards of space, you can transport the junk to the dump. Our 40 yard container is contractor’s choice for building planning. You can transfer 20,000 pounds of heavy scaffolding. It is a great trash removal option for any building manager. You have probably spent all morning searching for a roll off rental. Waste no more time on this effort. Discount Dumpster has supplied the community with walk in dumpsters for quite a while. Our roll offs come backed by our company satisfaction guarantee. If something does not seem right during your rental process don’t hesitate to let us know. Our staff is superior when it comes to taking care of waste management. We are able to service most residential and commercial locations. Call us today to have your dumpster by tomorrow! What are you waiting for? The garbage has to be removed with no delay. We offer roll offs in 10, 15, 20, 30, and 40 cubic yard sizes. 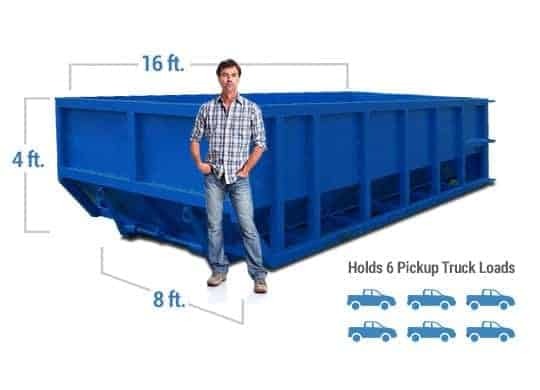 Our walk-in dumpsters have the capability of holding up to 15 pickup loads of heavy material. This is great when you only want to toss all your unwanted items in one swoop. So call now before the refuse pile becomes too much to handle. How many bins can I order? There is no limit to the containers you can rent. Let us know the size of your project and we can give advice on roll off sizes and prices. Where do you deliver? Our drivers can deliver to just about any location. We ask that there are no overhanging branches or wires, and that the site is level. Do I have to be on location for delivery? There is no need for you to be at the site. Your delivery can be confirmed with a phone call. We can work around any schedule. For commercial and residential deliveries drivers will need up to 60 feet of distance to roll the dumpster off the truck and into place. Not only will 60 horizontal feet be necessary but an additional 25 feet of vertical clearance is needed. When the dumpster rolls off the back it comes in at a diagonal angle which lifts it up to 25 feet. We can’t have any wires hanging down for safety of all our customers and drivers. If you plan to place a dumpster on the street you may need a City of Aurora Temporary Use Permit. There is no cost to the permit but it allows the city to be aware of right-of-ways that may be blocked. The list of prohibited items ranges but it is important to check before disposing of any trash. If you are unable to throw it away in your weekly residential pickup than you are unable to throw it into the dumpster. The main items that are not allowed to be thrown away includ, but are not limited to, TVs, tires, and refrigerators. Need some extra time with your dumpster? If you need more time to load up your roll off container, you can keep it past its original rental period for a daily rate. For just $15/day you are able to keep the dumpster onsite. Be sure to notify our team should you need to extend your rental. We do need a 48 hour notice in most cases in order to fix the route. Give us a call and our team will be happy to help you.